England in the late eighteenth century was a land of lively, inquisitive, energetic and practical people, but – and it is a big and tragic “but” – it was also a land where a tiny minority controlled most of the capital. These “well favoured” men were determined to preserve their form of learning as the defining point of their difference with the common man. The Industrial Revolution, and the mass manufacturing economy that it spawned, largely destroyed the old craft ethic of thoughtfulness and personal involvement. It reduced apprenticeship by the mid twentieth century to an almost meaningless “serving one’s time.” The earlier integration of home, community and work that had characterised English society for centuries was replaced by a mass manufacturing society which took parents out of their homes, and largely left children either unsupervised, or as cheap, disposable factory labour. No longer had parents skills they thought worthwhile to share with their children, and children saw little to interest them in their parents’ boring lives. Quite simply there was no longer much for families to talk about. Seeking both a custodial and an instructorial solution to “what to do with the children” mid nineteenth century social activists turned to the decontexturalised model of the traditional, classical school as earlier defined by Roger Ascham, and still tottering along in the grammar schools with their emphasis on memory and repetition. Schooling, as established for the masses in the mid nineteenth century, was to be about abstract thought processes rather than applied skills. To this was added, at the insistence of the Churches, the responsibility for moral and ethical education. Mass schooling soon came to resemble the techniques of the factory. As the nineteenth century gave way to the twentieth, formal education, in exchange for conforming to its processes (however uninteresting), and for learning its basic skills (that did not personally empower youngsters to think for themselves), was reasonably successful in inducting whole generations of people into a moderately comfortable society where they had little thinking to do for themselves. (Read of the antics of Mr. Gradgrind and Mr. M’Choakumchild in Charles Dickens’ “Hard Times”) Such a trivialisation of human expectations recompensed the lack of stimulation in adult work with wages just sufficient to purchase a way of life that now came to see its reward in what goods – manufactured by somebody else – this enabled the dumbdowned workers to purchase for their own entertainment in their “free” time. By the beginning of the twentieth century working and living had become separated in a way that the old craft ethic could never have anticipated, while by mid century the reality of youngsters too old to be treated as children but not yet in meaningful employment – “teenagers” – was apparent in England, America andn some other developed countries. Then, as the smoke stacks of the Industrial Revolution collapsed in the late 1970s, so called developed countries realised that the mass of their populations really just wasn’t that developed after all. Long years of simply repeating routine skills left displaced workers with little faith in their ability to learn new skills. Most recently globalisation, assisted by ever more sophisticated information and communication technologies, has opened up world markets to entrepreneurs on a scale which, little more than a decade ago, would have seemed inconceivable. The corollary to that, of course, is that unskilled workers in developed countries now compete directly with labour in the Third World. The difference between rich and poor is now as likely to be defined by which end of the street you live in, as it is by your nationality. “To thrive in this new economy” politicians in many lands tell their people, “We need to invest in our national creativity, our entrepreneurial skills, and higher order thinking and processing skills.” Which sounds largely right. When such politicians then go on to urge that we should all be collaborators as well as competitors, and be as concerned for the well-being of the community as we are for our individual needs, it sounds as if we are heading for a possible utopia. However, it is how we will reach such a place that political solutions in many countries seem to be pointing in exactly the wrong direction. The devil is always in the detail. “What we need is more schooling, longer hours, more subjects, more accountability, and higher standards”, such politicians declaim. 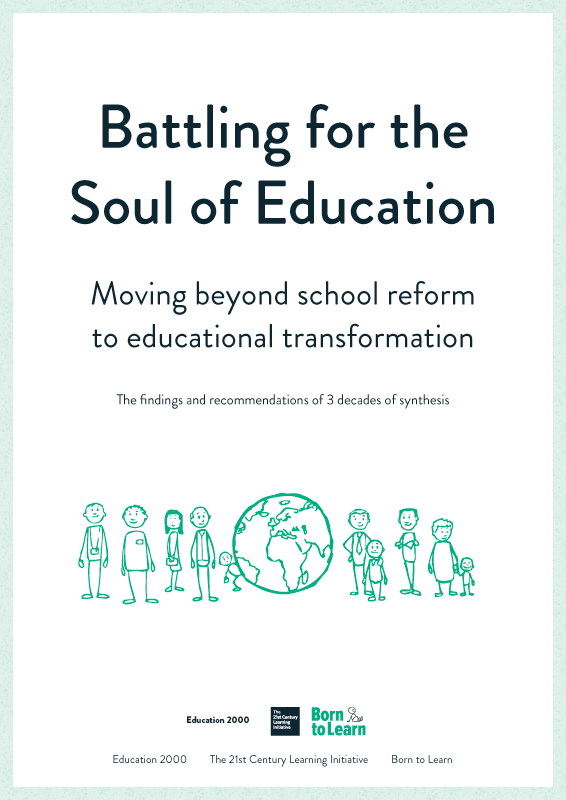 The assumption seems to be, and has been in England since the Education Reform Act of 1988, that while the present model of schooling (five to eighteen years of age with transfer at the age of eleven) and the diminished role of the community and home, does not work as well as its advocates would wish, this is because of inefficiency. It is not the system which has to be blamed, it is the people within the system who have just not been up to the task, we are told.